This is a premium shampoo at an affordable price! Using a quality shampoo like the Chemical Guys Maxi Suds II allows you to wash your vehicle safely and effectively. It is extremely gentle so it will not strip off any protection from a sealant or wax. We recommend you pour 2 gallons of water in your bucket and then add about one to two ounces of shampoo and continue to fill it with water until the suds reach the top. 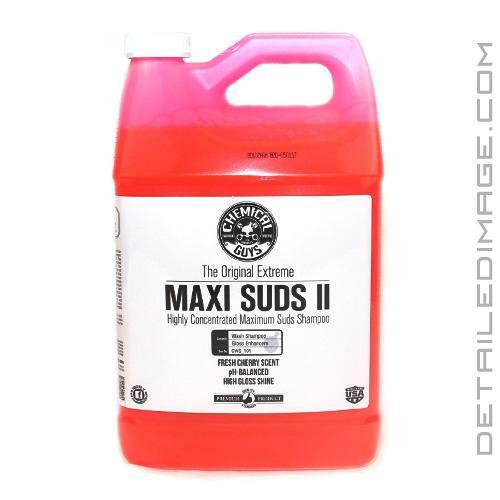 You will instantly notice the extremely rich and dense collection of suds, which explains why this product is called Maxi Suds II. Use your favorite wash mitt or sponge to start washing and you will feel a nice slick surface that is easy to work with. It readily breaks up stubborn build ups and encapsulate them so they can be removed with ease while washing. If desired you can also use the Maxi Suds II in any foam gun or foam cannon. Try this premium shampoo and you may never try another one! Maxi-Suds II is a strong superior cleaning shampoo that delivers amazing cleaning results through a consistent release of foaming bubbles leaning Maxi-Suds II suds. Maxi-Suds II is a uniquely formulated foaming technology that works by suspending super polymers within each bubble allowing grim and built-up dirt to be effortlessly rinsed away. The unique lubricity of Maxi-Suds II loosens abrasive residue and allows it to be rinsed away without scratching the surface. Always start by washing the tires and wheels first. Don't use the same wash water on your vehicles paint as you do your tires and wheels, Mix one cap full of product with one gallon of water in a clean wash bucket. Always wash vehicle when the surface is cool. Rinse the vehicle with water to remove loose grit and surface dirt. Start washing from the top down and rinse the vehicle often. Frequent rinsing is important when washing on a warm day. Do not allow the soapy water to dry on your paint. Use a final rinse of free-flowing water (nozzle off the hose) allowing the water to sheet off the vehicle.